Sinn Fein's desire to rewrite the past and put "more soldiers and security forces in the dock" is behind the collapse of the Northern Ireland executive, DUP MP Nigel Dodds has said. Mr Dodds accused Sinn Fein of a "highly irresponsible decision" that had led to the collapse of government at Stormont, following the resignation of Sinn Fein veteran Martin McGuinness as Deputy First Minister over a green energy scheme. A number of Tory MPs joined in the criticism of continuing investigations into British veterans during the Troubles, with Defence Select Committee chairman Julian Lewis branding the probes grotesque. Mr Dodds told MPs: "We share the deep regret at the highly irresponsible decision of Sinn Fein to single-handedly cause the collapse of the present executive and precipitate what the secretary of state has rightly called this threat to the continuity of the devolved institutions. "It's clear from what Sinn Fein have said in their resignation letter, it's not about RHI, because had this continued we would have had the investigation and proposals to mitigate cost. "But it's because, according to them, they're not getting their own way in a whole series of demands, including rewriting the past and putting more soldiers and security forces in the dock - despite the fact they've just agreed a programme for government in Northern Ireland." Conservative MP Richard Benyon, who served in Northern Ireland, said the investigations were "a very one-sided judicial process". 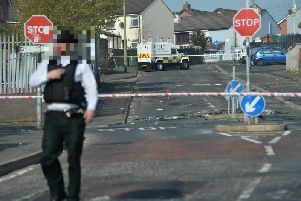 Mr Lewis said: "He has ably expressed the dismay at the grotesquely partisan and inequitable decision to instruct the Police Service of Northern Ireland to start pursuing retired British service personnel, whilst amnestied former terrorists freely walk the streets. "Will the Government bring forward legislation urgently, to offer them at least the same protection as the amnestied terrorists undeservedly enjoy?" Northern Ireland Secretary James Brokenshire said there were no amnesties that amounted to immunity from prosecution. He added: "He makes a broader point in relation to the need for a proportionate, balanced approach to legacy, to ensure that all aspects are investigated properly, rather than looking at one side rather than the other side. "That is precisely the approach I believe can be taken forward through the Stormont House agreement." The DUP's Gavin Robinson (Belfast East) called for a resolution to the issue, telling MPs: "It is unacceptable that veterans of the armed forces, who served the Crown, are waiting on the knock at the door whilst the terrorists walk free." Shadow Northern Ireland secretary David Anderson said Labour would support the UK Government in maintaining political stability at Stormont. Mr Anderson said: "The world is watching this. There's a huge amount of goodwill towards Northern Ireland, and huge admiration for the success that we have seen after decades of despair. "They look to the Assembly for a lead, and it's a huge responsibility on them and us in this House. "They do not want us to fail. They want us all to rise to hard challenges and work through them, and not just walk away when things get tough. "We know from sad experience that the worst thing you can do in Northern Ireland is leave a vacuum."